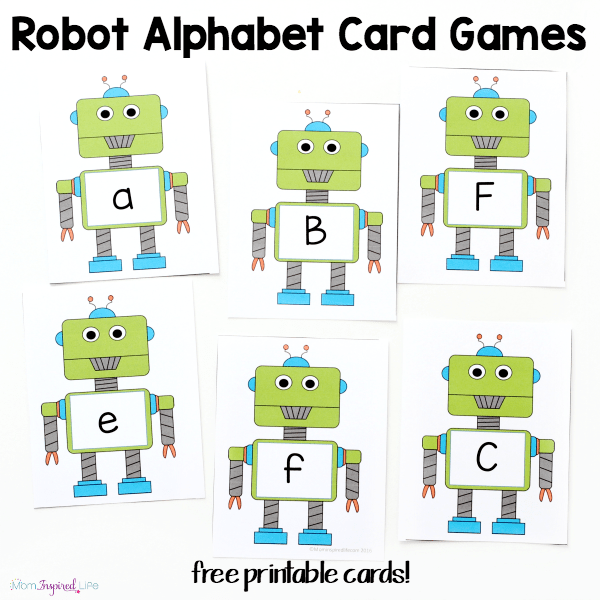 These robot alphabet card games are a great way to practice letter recognition, letter sounds, sight words and more! 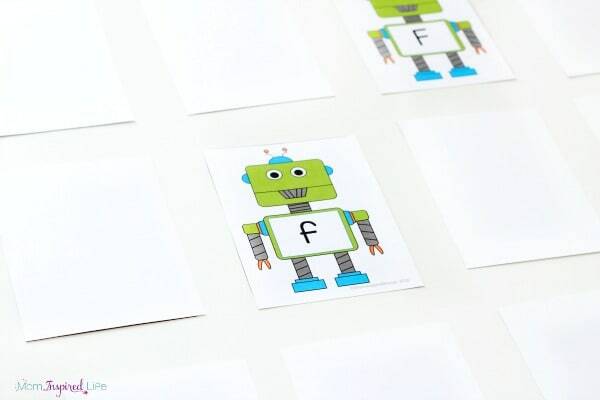 The free printable robot cards make it very easy for you to practice these skills with your kids. 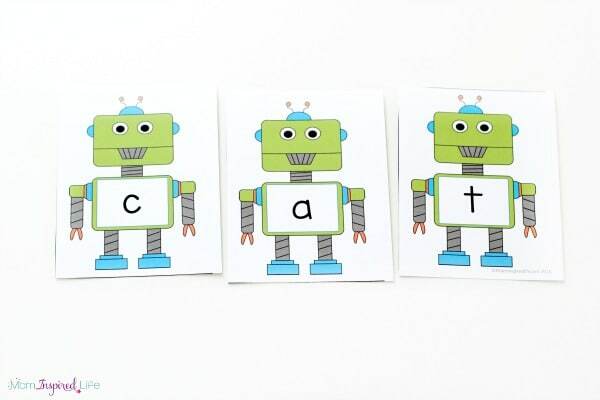 If your kids are interested in robots or you are doing a robot theme in your classroom, these alphabet cards are perfect for you! They are super versatile and can be used to review a wide range of skills. You can even adapt them for use with children on varying ability levels. 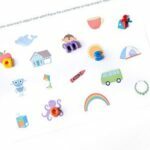 They are great for lots of alphabet activities too! We don’t use these as flashcards, but think of them like playing cards. So we have found a bunch of ways to play and learn with them. That is all! I am all about making this easy on you. Print the cards on cardstock for durability. 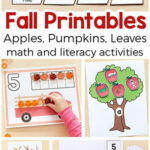 You can also laminate them if you will have a bunch of kids playing with and being rough on them. 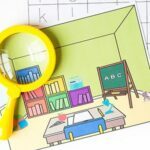 Letter Matching Game – To play this game you will choose a certain set of letters. For example, the letters a-e and their uppercase letter counter parts. How many letters you should work on at once depends on the age and ability of the kids who will be playing the game. For beginners, start with less cards and for more advanced learners, choose to work on more letters. Shuffle the cards and then spread them out on a table. Set a timer for a reasonable amount of time in relation to the amount of cards you are using and the ability of your child(ren). For five letters, I did about one minute. Once the timer starts, children will race to match up as many lowercase letters and uppercase letters as possible. If multiple kids are playing, use more cards and allow the kids to all try to find matches at once. I wouldn’t do this with more than 2-3 kids though. Memory Matching Game – Lay about 5-8 letters (both uppercase and lowercase) on the table face down in rows. Make sure they are shuffled around. Players will take turns flipping one card over and then another to see if they are uppercase/lowercase letter matches. If they are not, the player will turn them back over again and the next player will take a turn. If they are a match, the player gets to keep them. The player with the most cards at the end, wins! 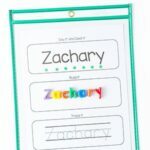 Spelling Your Name Activity – For this activity, you will need to have the uppercase and lowercase letter cards needed to spell each child’s name. So if a name has more than one instance of a letter, you will need to print that page as many times as needed. 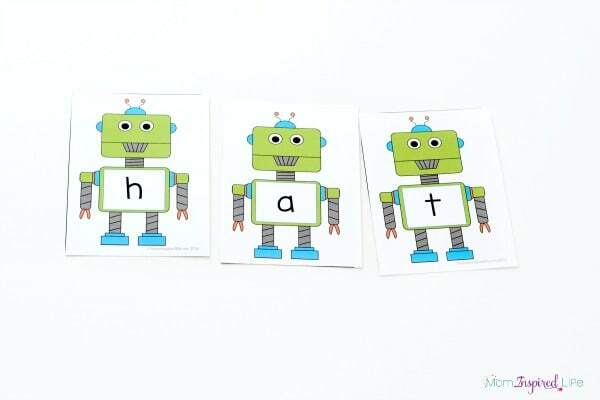 Put a bunch of robot letter cards all over the table. 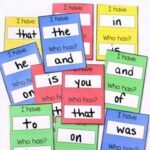 Invite the child to find the cards that represent letters in their name and then put them in order to spell their name out. 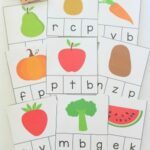 Spelling Sight Words Activity – Children will find the lowercase letters needed to spell sight words of your choosing. For my son, I write the letter on a piece of paper and then he looks for the corresponding alphabet cards needed to spell that word. Then he puts them in order. 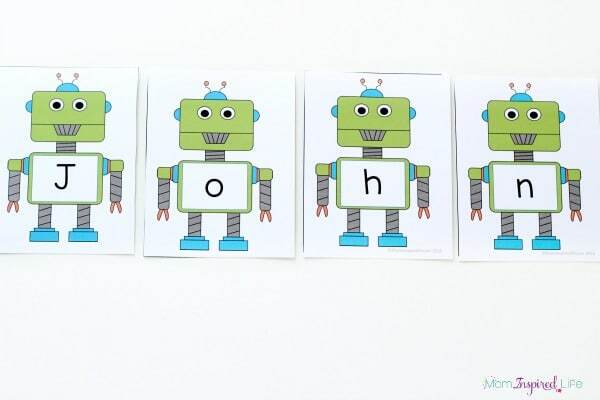 If your child is more advanced with this skill, you may be able to simply say the word and they can find the letters and put them in order to spell it. 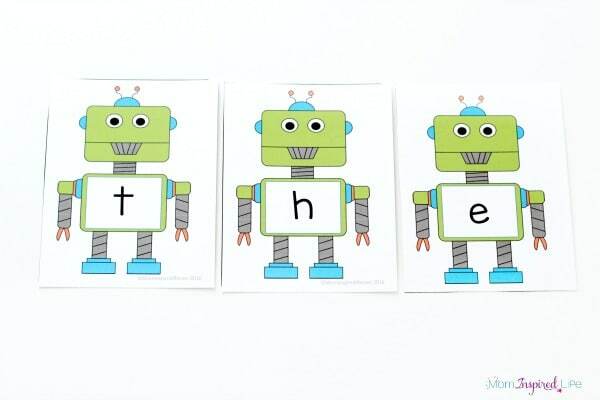 CVC Word Family Activity – I laid the robot letter cards for “a” and “t” on the table. Then I invited my son to find a letter to place in front of them on the table. For instance, he found the “c” card and placed it on the table to spell “cat.” Then I invited him to switch out the c for another letter and so on. You can do this for any word families you would like to review. 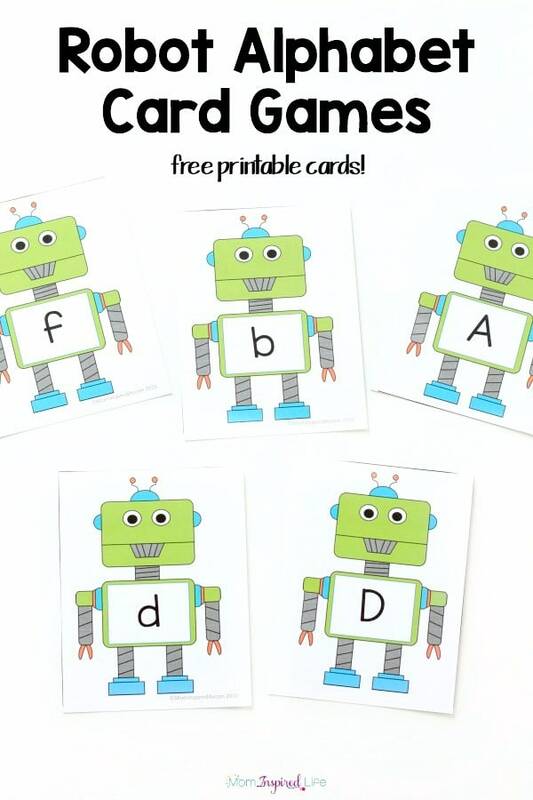 As you can see, there are so many great ways to utilize these robot alphabet cards! Can you think of any other ways to use them? Let me know in the comments. 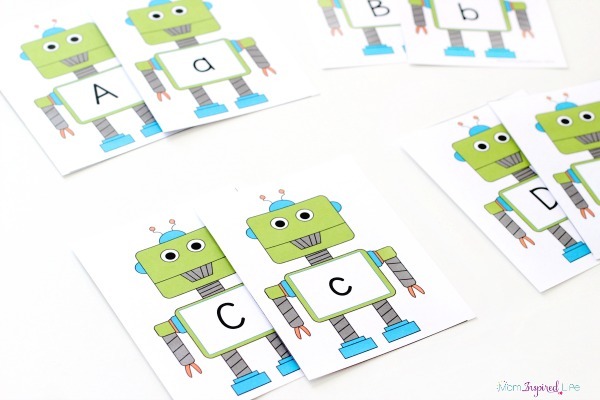 Here are six more robot activities for kids!